An article yesterday on one of the finest “new age” news outlets, The Huffington Post, emphasized further what is wrong with media these days. Ari Herzog evidently woke up with a burning in his gut, an inextinguishable one telling him; “Social media needs you.” More likely, he needs social media and the accolades it provides. While real human beings beg the world for their very survival, Arianna Huffington’s publication serves as a springboard for still another guru of BS. Beating drums and blowing personal whistles at such a time is nothing short of diabolical in my view. Somehow I failed to notice that Huffington was anything like Perez Hilton and other self serving monarchs of madness. Somehow. Sure, we all have our personal motives for publishing news, but at the expense of the broken? I have a tune playing in my head now from a line in a Beetles song, a sort of anthem for most of the social media “experts” out there; “Come together, right now, over me.” Apparently, no matter what happens, no matter who dies, some of these self proclaimed monarchs of new age media will capitalize on it one way or another. It is not the use or knowledge of social spheres that differentiates all of us, it is the motivation and methods – just like in any other sphere of influence. At least this is that way I see it. “Viewing Haiti Through Social Media, ” as Herzog’s spin goes, is both time inappropriate and insensitive to the extreme. The story reminds me of an argument we had last year with social media guru Todd Defren, Principal at Shift Communications and editor of PR Squared. That disagreement was basically over the same type of circumstance, namely Defren’s summoning of the armies of social chaos over the death and filming of Neda. Defren, regardless of his genius or position, went outside the boundaries of my own moral imperative (and many other people’s) in strumming social media’s Les Paul electric atop a horrible circumstance. Video at 11:00 combined with tweets to show the power of digital media? Sort of like bragging on television and the gossip at town hall as the Earth opens up and swallows Kuwait. I never saw that, did you? Todd got the awful part right, but never understood really what my differences were, let alone offering the benefit of any doubt. In fairness to him, I was not kind in my writing about it either. Todd carries on as always, which is his prerogative. Leading affords some advantages and privilege as we all know. I do not think even Defren would have spit his pea soup across the dinner table like Herzog did though. Haiti, as a circumstance, is because of the gravity and numbers of people, a far worse case for self promotion or the taking of tangents for traffic. Bad journalism in every regard especially given Huffington’s value. If you are asking why this is a big deal, you will never understand obviously. Making mistakes is a human thing after all, but obtuseness and inconsiderate action seem to me to be a terminal disease for some. Social Media expert, or caring human being? Social Media expert always. If I can quote Herzog briefly, maybe a more clear picture of what I am talking about can be seen. The next sentence characterize for me a person desperately trying to use news, any news, to further their own ends. I insert what may have been the intent in parenthesis. This is a blog post about Haiti (because it is a trend) and social media (because it needs all the help I can give it), a look at how the internet is changing human perception (and especially because of us gurus who bring it to you) from up close and far away; and how we’re quickly realizing in a way 9/11 (because this is a universal term you can identify me and social media with so that you will never again be attacked) never showed us, that we’re very very close to each other and we have the technology to prove it (especially me and my fellow social media experts). Well, at least that is one way of perceiving what the author meant. You know, PR and marketing having a bad name (akin to lawyers and such) is many times for good reason. 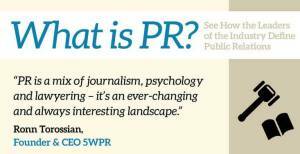 Even Todd Defren talks about this in a recent article – the gulf between good PR and bad PR professionals. Just how we define this gulf is arbitrary or subjective in most cases. One way of thinking about proper behavior in this sense is to consider it from the perspective of the “innocents” as subjects of news. Using Goldman Sachs as a villain in an article is far detached from using dying and starving people to promote self or business. No one can know the truth of the matter, where Herzog’s motivations lay. But, the impression a story like this leaves can easily be construed as wrong. You can rest assured if social experts like those described were the villains of Avatar, not a weed of their environment would be left standing. And here are some tips on how to effectively use Social Media during an emergency, and some statistics behind it. You are entitled to your opinions, Phil, as am I, so let me set two items straight. First: I am not paid by the Huffington Post. Second: If you deny the importance of social media, then why do you keep a blog? The blog post I wrote summarized how social media had, and continues to gain, Haiti prominence. Hi Ari, Thank you for stopping by to comment. Sometimes as an editorial writer I tend to “get on my ear” and point out things perhaps a little too vehemently. I usually take the time to premise things a little better, by pointing out the good in professionals (more out of fairness than Machiavellian intent). I did not do this so much in referring to your article, I should have. For writers of your caliber, even terrible typists like me, a higher standard should be expected. If you article had come out today, it would have been far less inappropriate for me personally. My opinion is not the end all of course. “Who am I?” is a good question, but the answer is simply, “someone who wants us all to do better.” Social Media is fascinating and potentially world changing for sure, but as I stated in the article – not something that need to ride on the back of tragedy. I hope we can help one another to up our game Ari. If I goof up (besides the 40 typos – this is incurable) in my posts, please tell me. Again, I meant no personal affront to you, just a rant about the appearances and how those affect us all. Cheers and thanks for commenting.